« From $248,900! The Wohlsein Vancouver Mount Pleasant Condos for Sale in Brewery Creek District! Original Style Homes at Impeccable Pricing! A beautiful new project in the heart of West Coquitlam’s Burquitlam real estate district is now selling! 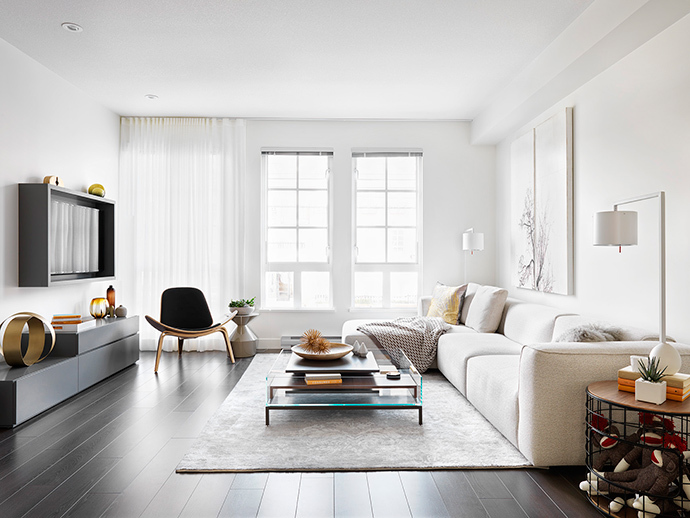 Brought to you by Intracorp Developers, one of our favourite boutique local builders, the Foster Avenue Black+Whites Coquitlam townhomes is all about designing and creating the perfect homes for today’s homebuyers. Located close to major transit routes including the Evergreen SkyTrain Line (currently under construction), Highway 1 and the transit station (bus and SkyTrain) at Lougheed Town Centre, this extraordinary West Coquitlam townhouse project will be located on a quiet residential street near several walkable parks and schools and a community that is located directly next to the new Burquitlam Black+Whites Rowhomes. As with any Intracorp development, the Black and Whites Coquitlam townhomes will be superbly designed and constructed with the best quality materials and amazing customer service through your purchase cycle. The inspiration of the black and white architecture is from the New York 1930’s style and is designed by award winning firm Ramsay Worden Architects. Some of the detailed finishes of the exteriors and community at the West Coquitlam Black+Whites on Foster Avenue include detailed and custom front gates, detailed brick and hardi board cladding with strong black and white colour contrasts for a unique look, private entry with manicured landscaped front yard, large overheight deep set mullioned windows and richly coloured doors. 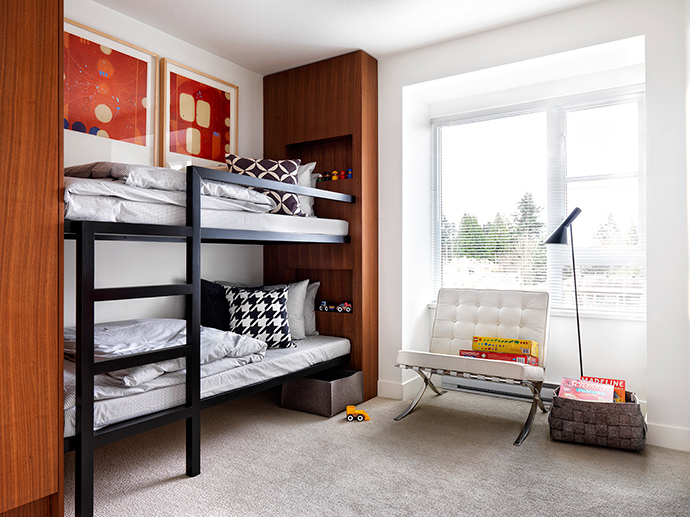 The floor plans at the Foster Avenue Black + Whites Coquitlam townhomes also feature attached garages with room for either one or two cars plus bikes and all homes come with the Third Party Warranty Insurance for 2/5/10 years. For more information about the Intracorp Black and Whites Burquitlam rowhome development, please visit their corporate and project web sites online at www.intracorp.ca/blackandwhites/. Please note that the Black+Whites Coquitlam rowhome property is currently under construction and will feature 2, 3 and 4 bedroom floor plans with a total of just over one hundred homes built over three phases. Presales have already started, so please register today! In addition, the Black + Whites Burquitlam rowhomes will feature a large amenity space fit for entertaining and fitness that includes a full gym, multi-purpose room and an entertainment room with a kitchenette. Intracorp developers is very well known for its craftsmanship and sophisticated interior colour schemes and palettes. 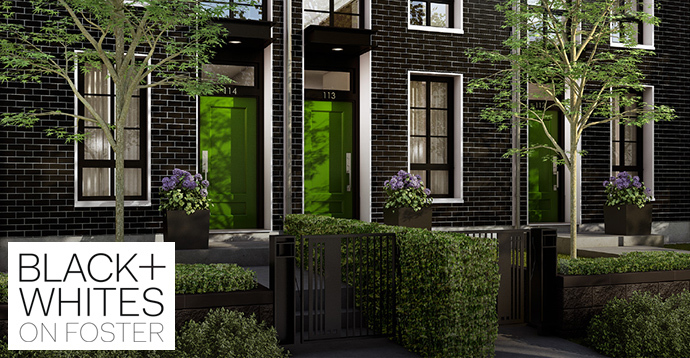 At the presale Coquitlam Black+Whites Rowhomes on Foster Avenue, homebuyers can choose between 2 rich colour palettes (either Black or White) that is carefully selected by BYU Design. The living and dining rooms, kitchen and entry will feature laminate hardwood style floors and the bedrooms will all have plush low profile carpets. The main floors will feature over height nine foot ceilings and the homes will also feature one inch Venetian blinds throughout. The Black and Whites Coquitlam townhomes will also feature wood baseboards and door mouldings, stacked front loading washer and dryer on the upper floors for added convenience in addition to a linen closet. Other interior features include built in wire shelving in the bedrooms and hallway closets, built in media conduit in the living room and the master bedroom as well as over height ceilings in the master bedroom (most homes) and pre wiring for a ceiling fan. 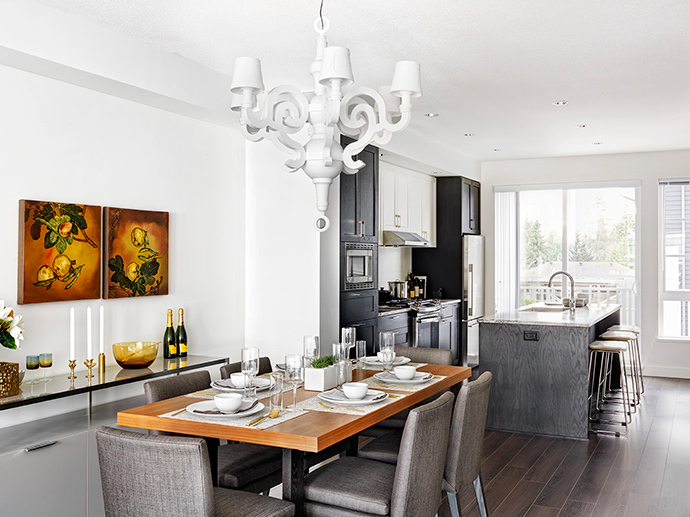 The kitchens at the presale Coquitlam Black + Whites Rowhomes will include a kitchen island with seating, storage below and pendant lighting complete with a dimmer switch in addition to a blacksplash window in corner homes and counters with granite slabs. Other kitchen features include a double bowl Sonetto stainless steel under mounted sink with Grohe facuet and spray, tandem under sink recycling station, halogen under cabinetry lighting, full height tiled backsplash in glass and stone mosaic or porcelain penny rounds. The cabinets will have a combination of painted lacquer and real wood shaker style and they will also have soft close mechanisms on drawers and doors, over height cabinetry and even pantries in select homes. 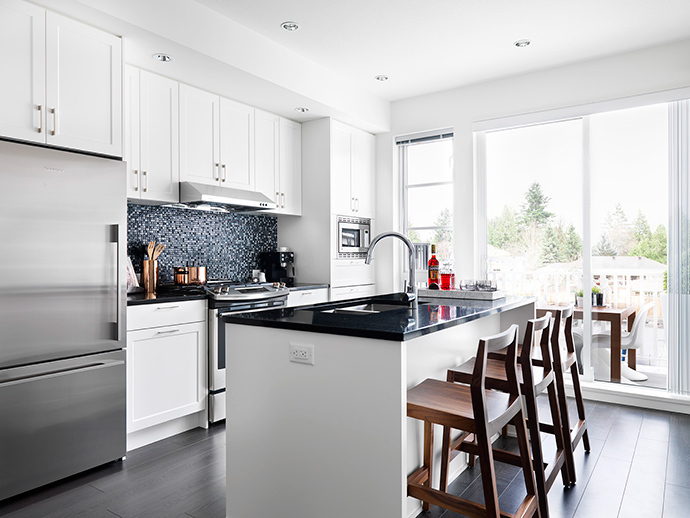 The appliance package at the Black+Whites Rowhomes in Burquitlam real estate district will feature a GE stainless steel gas range, Energy Star stainless steel dishwasher with concealed controls, stainless steel hood with dual fan and stainless steel microwave with trim kit. There is also a Fisher&Paykel stainless steel counter depth bottom freezer/fridge. 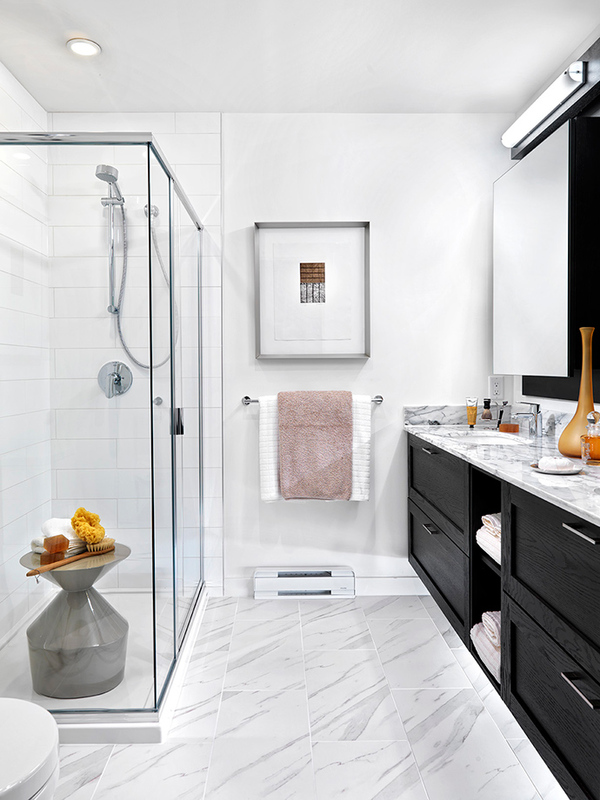 The bathrooms at the Burquitlam Black + Whites townhomes will include beautiful 12×24” tiled porcelain flooring, Grohe lavatory faucets and fixtures in addition to custom designed vanity with shelving and mirror in ensuite and under cabinetry lighting with motion sensor in the ensuite. There are single bowl undermount Duravit sink, Duravit toilet and solid marble counters. The Black + Whites employs a sophisticated yet simple approach to design inspired by the timeless character and street appeal of the 1930s east coast urban row home. 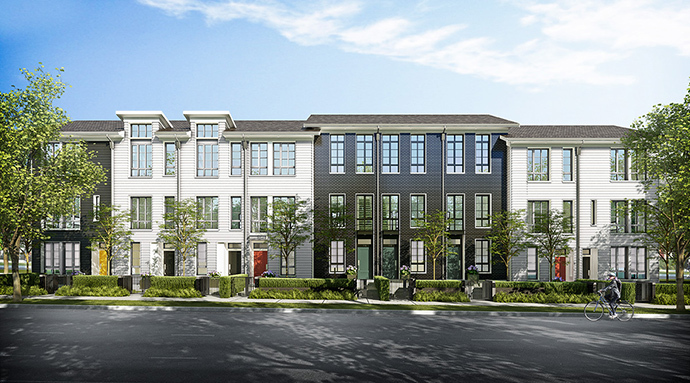 Located in the heart of Burquitlam just a few blocks from the new Evergreen Line, the community of 107 row homes will consist of 2, 3 and 4 bedroom homes with thoughtful plans and generous decks. With construction commencing Spring 2014, homes will be available for move in this year.